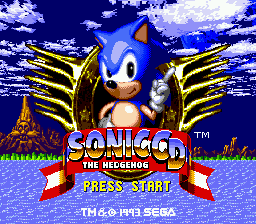 Sonic CD is just your average Sonic the Hedgehog game on a CD... that's what you're told, anyway. Press Up, Down, Down, Left, Right, B at the title screen. Note that you will be taken back to the title screen upon completion of the selected level or upon attempting time travel. If the level was ended by attempted time travel, entering the Level Select again and choosing another level will start the level as if you had traveled through time, keeping any rings and accumulated time from the last level. The level select screen skips from level 1 to level 3. The missing level 2 is known as R2 because it was missing in the PC version which stored the levels in R# folders. 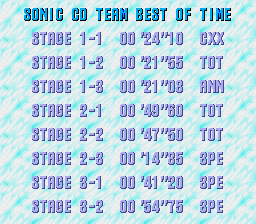 Press Right, Right, Up, Up, Down, C at the title screen to see the best times that the team behind Sonic CD got in Time Attack mode for each stage and act. High Speed Shoes music plays in the background. At the title screen, press Down, Down, Down, Left, Right, A to go to the sound test. By entering the following codes, you can get the corresponding image, debug mode, and/or extra after pressing Start. DA NO.11 Tails holding goggles next to a fourth-generation Lotus Seven, with the words "SEE YOU NEXT GAME" above it. This code also activates the debug mode: like the previous Sonic games, press B to change from Sonic to an object, A to cycle through objects, and C to place an object on the screen. 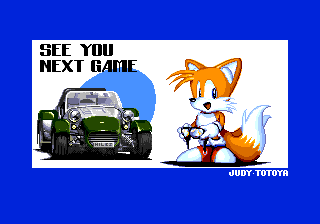 Also, the Tails unlock screen on the 2011 remake says "SEE YOU NEXT GAME", most likely as an Easter egg. Drawn by Yasushi Yamaguchi (also known as Judy Totoya/Toyota, as seen here), character designer for Tails and special stage designer for Sonic CD. The "Little Planet" theme plays here. DA NO.21 An unusual Batman tribute. 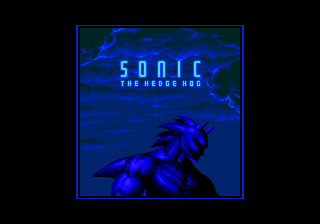 Drawn by Takumi Miyake, landscape and visual designer for Sonic CD. The final boss music plays in the background. 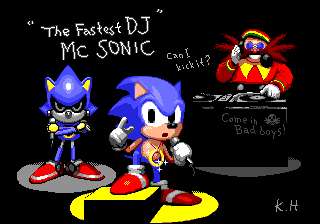 DA NO.01 Sonic, Metal Sonic, and Eggman gettin' funky. Drawn by Kazuyuki Hoshino, character/special stage/visual designer and illustrator for Sonic CD. Metallic Madness Present music plays in the background. DA NO.09 A cute Sonic with grey eyes. The Palmtree Panic Good Future music plays here. The message says "ゆーあーくーる　by さんちゃんず" (You are cool, by Sanchanzu). 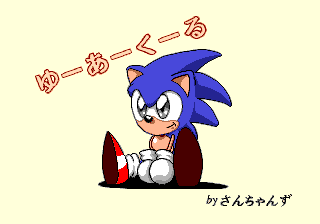 Drawn by Masahiro Sanpei, landscape designer and animation visual director for Sonic CD. DA NO.25 A rather creepy wallpaper collage featuring multiple Sonics with a freakish humanoid face. The boss music plays. 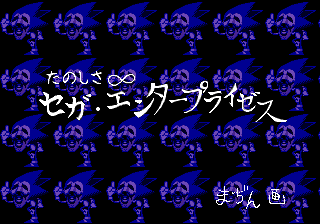 The Japanese text reads "たのしさ∞　セガ・エンタープライゼス　まぢん画" (Infinite fun. Sega Enterprises. - Mazin Picture). Drawn by Masato Nishimura, landscape designer for Sonic CD. Mazin is his childhood nickname, as explained here. 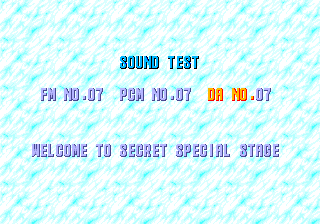 DA NO.07 The text "WELCOME TO SECRET SPECIAL STAGE" will appear, after which that stage will load (see below). As mentioned above, setting all three Sound Test selections to 07 will load this stage that features the enlarged head of Eggman as its background and has a rather difficult layout. It's possible that an extra Time Stone was to be collected here at one point, though it's probably just a little bonus thrown in for curious players, much like the hidden pictures. Completing this Special Stage will display a secret credits screen. Sonic being electrified An animation of Sonic being shocked by electricity. It may have been used in Wacky Workbench, which contains various level elements with the potential to electrify the player. It could also have been used in Collision Chaos as part of the Metal Sonic sequence in the 510 prototype. Used in the 2011 remake, when you get shocked in Wacky Workbench. Sonic falling An animation of Sonic falling into the distance. Purpose unknown. A similar animation is present in Sonic 1, also unused. Sonic waving his arms An animation of Sonic waving his arms with his palms outstretched. This could have been used in Tidal Tempest when walking through the water, to simulate an attempt at moving more quickly. Sonic looking backwards Sonic looking over his shoulder. 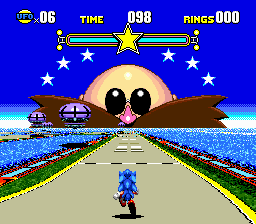 Purpose unknown, possibly for Stardust Speedway's bossfight when Dr. Robotnik fired lasers behind Sonic and Metal Sonic. Sonic sneezing An unused animation of Sonic sneezing. Purpose unknown. Curiously, he also appears sneezing in the game's intro. Sonic upside-down An animation of Sonic upside-down with his eyes wide and his mouth open. This suggests that this animation could have either been used for an alternate death animation, or if Sonic was caught by an environmental hazard that dangles him in the air somehow. Interestingly, the first sprite was used in the Game Gear and Master System versions of Sonic 2 for the title card of Underground Zone. Sonic grabbing Sonic grabbing onto something and attempting to create traction. This implies that he may have been trying to stop something from pulling him into some sort of hazard. Part of a scrapped badnik, maybe? A modified version of this sprite appears in Sonic Crackers. Sonic on horizontal pole Similar to the other horizontal pole sprites from Wacky Workbench, this one has Sonic swinging his feet forward. Perhaps he originally had to pull away from electrical hazards positioned underneath? Sonic shrugging An animation of Sonic shrugging his shoulders. These sprites are found in SPSS__.BIN, which contains Sonic's Special Stage-specific sprites. His spikes rise during each frame, and in the final frames of the animation, the very bottoms of his feet disappear, as though he is sinking into something, or possibly falling down a hole. Perhaps an unused quicksand hazard, a trapdoor, or even being pulled out of the Special Stage altogether, as a "failure to obtain the Time Stone" animation judging by his annoyed frown in the last few frames. Sonic hanging An animation of Sonic being pulled up by...something. Purpose unknown. These sprites are also found in SPSS__.BIN. Early screenshots show hot-air balloons, not UFOs, in the Special Stages; perhaps they caught Sonic and floated him around? Sonic falling back An animation of Sonic being knocked back. Purpose unknown. These sprites are also found in SPSS__.BIN. Sonic leaping An animation of Sonic leaping. Purpose unknown. These sprites are also found in SPSS__.BIN. Sonic with chest forward An animation of Sonic with his arms outstretched and his chest pushed out in front of him. While its purpose is unknown, some believe that this is somehow related to transforming into Super Sonic. Sonic skidding An animation of Sonic skidding whilst looking the other way. It is unused in the main game, but does appear during the "You Are Greatest Player!" sequence seen once beating the Time Attack scores. 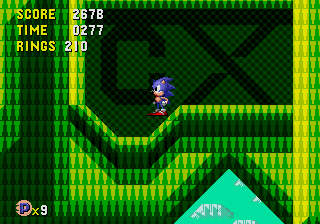 It's fairly similar to the skidding animation in Sonic Crackers and Sonic Mania, and could have been used while skidding at higher speeds in contrast to the normal skidding animation, which was modified from Sonic 1. Unused Amy sprites Sprites of Amy with hearts in her eyes. While they go unused here, they are used in the 2011 remake. Oil Slick Would have appeared in Special Stages. These can be found normally in some prototypes, but are unused in the final (and are still non-functional). Broken Switch It has been speculated that they may have been used in the Bad Future of a Zone, to prevent access to certain routes. Regular switch sprite present for comparison. Moving Platforms Moves up and down while moving to the left. They come in two variations: a pair and a group of four, all of which do the same thing (though in the latter, the top row are flipped vertically). While technically used in the Futures of Quartz Quadrant, these variants for the Present and Past do not appear anywhere in their respective time zones. Conveyor Belt Platforms Conveyor belt platforms for the Past version of Quartz Quadrant. While these platforms exist in the Present and Futures, they do not appear anywhere in the Past at all, so these Past variants are never seen. Swinging Conveyor Belt A swinging conveyor belt platform for the Past version of Quartz Quadrant. Like the platforms above, this object exists in the Present and Futures, but this unique Past variant doesn't appear anywhere. Hand Appears to be an unused Special Stage item. Purpose unknown, but may have stopped the timer. There are some monitors that aren't used in the final game, but are used in some of the prototypes. You can access the monitors in all major releases of the game from the Debug Mode. You can also access some of these in Palmtree Panic Act 3 by beating the boss, using debug to place yourself far below the coordinates of the boss fight and then exiting debug. Clock Monitor This monitor is supposed to stop time for a few seconds, but it doesn't work correctly. It can stop the animations of rings and monitors as well as rotating palettes, but that's it. Blue Ring Monitor This monitor has no effect. In the 510 prototype, it had the same effect as the "S" monitor, while in the 712 prototype it acted as an invisible shield that can stack with a regular shield. Its icon would be repurposed for the Combine Ring powerup in Knuckles' Chaotix and redrawn for the similar Hyper Ring powerup in Sonic Mania. "S" Monitor Breaking this monitor gives Sonic invincibility, power sneakers and a shield all at the same time. The icon is used in the 2013 remakes of Sonic 1 and Sonic 2 for the S monitor, although the monitor works like in Sonic 3. This sound effect is odd in that it's a CD audio track on the disc. When the game disc is inserted to a CD player, you can hear this sound on track #2. The 712 prototype used this sound for time travel. Not sure what it is. Sounds like it would come from a harmonica? FM NO.22 is a duplicate of this sound. Sounds like a Spin Dash or a Super Peel-out being jammed. A different version of the sound heard when pressing a button. The warning bell usually heard underwater in other Sonic games, only high-pitched. The 2011 rerelease uses this sound, albeit at a lower pitch. Sounds like something being shot. An electrical sound of sorts. A loud, harsh buzzing sound. Not sure, but it sounds like something rising or powering up. This sounds like FM NO.55, but it has a resonating sound underneath it. A very high-pitched "ding" sound. Later used in Sonic Mania for the Hyper Ring powerup. A higher-pitched version of Sonic losing his rings. This one sounds like FM NO.63, only without an echo. This one sounds similar to the door sound at the end of the Metal Sonic race. This sounds like variant of FM NO.68. Perhaps it could have played alongside the sound. Another variant of FM NO.68. Yet another variant of FM NO.68. You guessed it. Another FM NO.68 variant. Sonic saying "Yeah!". This was used as the extra life sound in the 712 prototype. This screen, which features a scrolling banner saying "COMIN' SOON" while playing the invincibility theme, was used in the 510 prototype when the first three zones had been cleared. It manages to survive all the way into the final game and can be viewed by selecting "COMMING" in the Level Select. Near the end of Quartz Quadrant Zone 1 Past, there is a small, inaccessible room with glitched collision and the letters "CX" in the background made from shadowed yet used tiles. 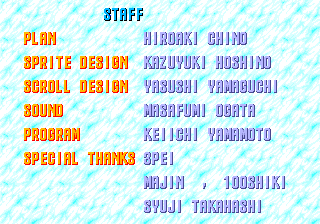 It could be possible it's a signature from one of the game designers, as these letters also appear in the Sonic CD team's best times screen (though with an extra "X" added), as seen above. Who the initials belong to is unknown. Almost the entire soundtrack was redone for the American version by Spencer Nilsen because Sega of America thought the soundtrack of the Japanese and European versions sounded too identical to the electronic dance soundtracks being produced at the time, so the American soundtrack has more of a rock feel. One example of this is the theme song: instead of "You Can Do Anything", the American version has "Sonic Boom". The only songs that weren't altered were the Past themes, since those were played through the PCM chip and not Redbook. The Past themes are also stored directly on the ISO file on track one as opposed to being separate tracks on the game disc. Some of the music placement was switched around. For example, the "Little Planet" theme now plays on the Time Attack screen (rendering the title theme copy unused), and the music played during the Metal Sonic race is now the normal mix of Stardust Speedway's current Future and not always the "B" Mix. 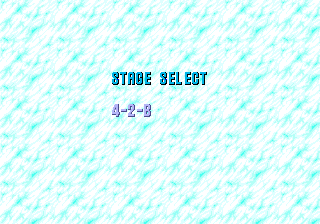 The player can restart the stage at any time by pressing a button while it is paused, eliminating some potential time warp issues. This is at the cost of one life. In order to remove Engrish, "YOU ARE GREATEST PLAYER" was changed to "YOU ARE THE GREATEST PLAYER"
There are no longer sound effects at the beginning of the ending. Due to the extended "Special Edition for North America" credits, the ending theme plays over the entire video and mutes other audio (including the post-credits). The bad ending's "TRY AGAIN AND FREE LITTLE PLANET FOREVER" text was shortened to simply "TRY AGAIN". The copyright text at the title screen was altered slightly. All of these changes are applied to all regional versions of the PC version, though the 2011 re-release reverts the Metal Sonic racing theme so it always plays Stardust Speedway "B" Mix and mostly restores the original ending videos' exclusive audio when played with the Japanese soundtrack. Games > Games by developer > Games developed by H.I.C. This page was last modified on 11 March 2019, at 07:27.